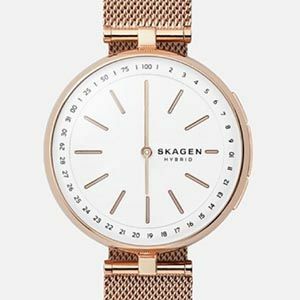 With the wearables landscape moving more sporty and dude-centric with every new impact-resistant device that comes to market, it’s nice that Skagen has debuted a dressy smartwatch made specifically for women. 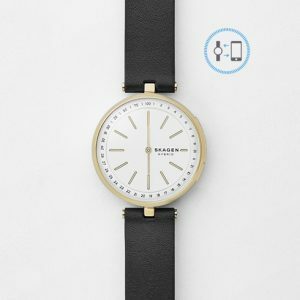 The pretty Skagen Signature T-Bar, made and manufactured by Fossil Group, features the smallest case (36mm) the brand offers in smartwatches and comes in four different colors: rose gold, yellow gold, a matte greyish-brown, and silver. Options for straps include metal mesh and leather varieties. The slim watch is essentially a notifier, so it vibrates to alert you to texts, emails, and phone calls you’ve programmed into its companion phone app. It can also control your music and take a photo, once those apps have been opened on your smartphone (the watch works with iOS and Android phones). Its small proportions and low-key good looks make it an ideal smartwatch for women in careers that keep them on the move—such as medical professionals and teachers. The smartwatch, which is priced at $195, is powered by a standard CR2025 coin-cell battery that’s replaceable. So no charging required.